Kandy looks all set for a washout this weekend, with hit-and-run evening rains persisting all week, as Kingswood and Dharmaraja take a hike to Pallekele on the 17th and 18th – Friday and Saturday – to which has been their Big Match spot for the past seven years. If the Trinity-Anthonian last week is an indicator, the Man of the Match is set to be the weathercock; but, let us not be too cynical and pessimistic; as Cricket has always proven, and amply too, that it is an unpredictable game where bookies don’t operate. Clearly, no bookie would dare operate too lightly, as Avishka Chandrasiri will lead the Kingswoodians against Deshan Gunasinghe’s Dharmaraja for the 111th time of the series that runs way back to 1893. There has been a lot of talk about “healthy rivalry” in an age of “enforced sportsmanship”, but Kingswood and Dharmaraja would love to resume business from where the party was left off last year, at this same venue; where Kingswood playing as a badly badgered underdog pulled out a sensational “first innings win” even after the media had earlier written them off as easy meat. To prove a point, they then staged one of the most scintillating run chases a Kingswood-Dharmaraja Limited Overs encounter had seen in the past 30 years, upsetting all cards in the game by snatching a last ball win against their fancied opponent. When the two teams hit the deck tomorrow (17th), Gunasinghe’s Rajan XI will be playing to regain the tainted pride, and Kingswood will be padding themselves up to move from strength to strength on the foundation they had laid last year. The atmosphere off the field is equally energized, with boosted spectator interest and various parallel showcasing like customized profile picture engineers to “support your team”, theme songs and such. The vehicle parade — something we on principle oppose and condemn — planned to coincide with the Limited Overs game will also add to the side-thrills of the game, for people interested in that kind of inconvenience. Kingswood is returning into reasonable and competitive Cricket after 5 long years in the kitchen of Hell. Between 2011 and 2015, Kingswood Cricket had nothing to show but a pathetic Zimbabwean record, and was trounced by the Rajans in 4 out of 5 Big Matches. In fact, the Dharmaraja attitude was always too competitive and fierce for the Kingswoodians, who were intimidated at every level of the game. The Rajan game plan in every match they won was to put a score on the board by batting two sessions, and to get Kingswood out twice in the remaining four sessions of play. This plan succeeded, except once, indicating how feeble Kingswood was as an opposition. Ruwantha Hathurusinghe’s team last year, not only upset this script with which the Rajans entered the game, but also managed to hold their nerve to outwit their more stronger opponent on all 3 days of Cricket. Surely, coach Indika Fernando had done the right mental and attitudinal adjustments along with other matters of technique and skill. The Kingswood-Rajan encounter is bandied as the “Battle of the Hill Country Maroons”, and it is also considered the oldest of Big Matches in the Hill Capital. In numbers, it is also considered by many as the third oldest of Big Matches, after the Roy-Tho, and the “Battle of Ruhuna”, between St. Thomas’ and St. Servatius’ Colleges, Matara. The series has been a Dharmaraja-dominated one, with a 35-19 lead in 110 outings. According to the Ancients, the first game between the two teams has been in 1893, the Rajans being led by their then Head Master D.B (later, Sir D.B) Jayathilake. Kingswood had been skippered by Louis Blaze’s confidante and deputy, Ernest Handscombe Spencer: a livewire in many of Kingswood’s early activities, complete with his handle-bar musto (In many articles, and news reports – which seem to copy one another virally – Spencer is referred to as “A.E Spencer”; whereas, the initials should stand as “E.H”). Regular “boys only” games had commenced in 1899, and there have been interruptions by wars, floods and famines (unlike, they say, the Royal-Thomian that had gone on uninterrupted irrespective of politics and global plight, which is frankly a bit disturbing). For Kingswood, the Big Match has been an El Dorado since 1958, when they for the last time in the series managed to, under the captaincy of Maurice Fernando, defeat the Rajans. Dharmaraja’s last win was in 2015; the last of those fatal five years for Kingswood Cricket. With the teams being more even, the Rajans can enter the game with a level-headed approach, deviod of the hype and banter which was sky high in 2016, where Facebook culture had already declared the Rajans victors even before a single ball had been bowled. Even the generally Dharmaraja-biased sportswriter from Kandy, Dharmaraja’s former Cricketer Upananda Jayasundara, was felt to be a bit more biased than usual in writing ahead of last year’s Big Match, as the smacking Kingswood has been getting for 5 years had made their players, supporters and news reporters giddy alike. With that monkey off the back, the Rajans can tackle the “old foe” on merit, and without unnecessarily undermining him. 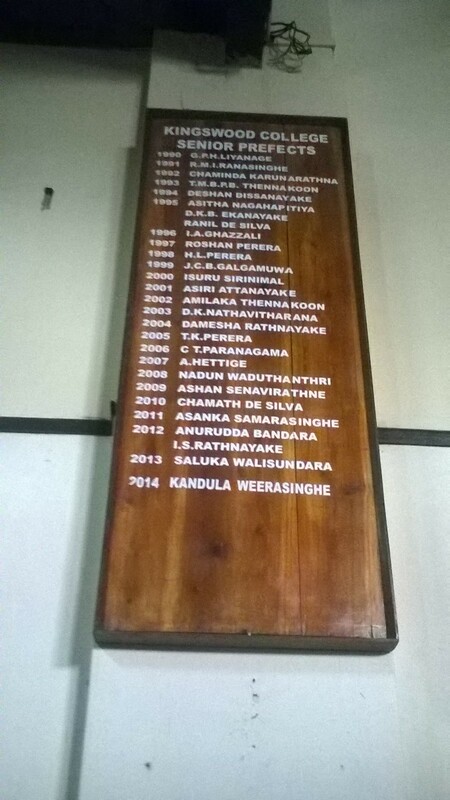 On another not entirely unrelated note, this year, both teams go into the game under two new heralds at the top — Dharmaraja’s D.M.T.P Wanasinghe, and Kingswood’s R.D.M.P Weerathunga, who are both settling down into their offices as Principals of their respective institutes. The Principals’ attitudes will be very crucial and will be reflected by the schools’ approach to the game, both on and off the field. Since late, there has been brought into the Kingswood- Dharmaraja encounter an “imitation culture”, where Prefects – specially – move about in their “cowboy hats”, taking time off from their traditional duties to “sizzle the dance floor”, swaying to the DJ and so on. While some schools have Prefects who wear hats and jive, Kingswood’s Prefects Court culture has often known to have their duty dared not flee, at the risk of heavy cost. The present Senior Prefect and Scribes come across as critical-minded chaps, and one has to see whether some of these “ugly scenes” from previous years will be trashed, and dignity restored to the office of Prefect. Except for the odd incident, the Kingswood-Dharmaraja encounter, in recent years, is an event-free two days of sportsmanship both on and off the field. With the generosity of that great spoiler – Rain – what is on the cards is a gripping contest between what on paper is the most evenly poised Kingswood and Dharmaraja XIs in, maybe, 7 or 8 years. Everything falling into place, it would by all means be for Kingswood a matter of fide et virtute; and for Dharmaraja, two adrenaline pumping days of අත්තාහි අත්තනෝ නාථෝ. Kingswood College won the 11th KM de Lanerolle Memorial Debate Tournament conducted by the school’s Past Debaters, a few weeks ago. In the final of the tournament they defeated Hillwood College, amidst a small, homely crowd at Randles’ Hill. Thus, Kingswood defended the title they won last year and recorded their 5th overall win in the series. The debate was evenly matched and was presided by Past Kingswoodian and well respected cinematographer, Mr. Vishnu Vasu. Kingswood began the tournament on the back foot, receiving a walkover from Good Shepherd Convent. They won against St. Anthony’s in the semis, but undoubtedly their best came in the final against the Hillwood team, who showed much class and promise throughout the tournament. In fact, Hillwood’s semi final against Girls’ High School was one of the strongest debates seen in recent years. It was as close as a debate could get where exchanges were concerned. Girls’ High School eventually won the Third place of the tournament. Copyrights of ‘Flashing Youth’ and Sajeer Aslam acknowledged. The presence of Hillwood Deputy Principal Ms. Nelum De Alwis (even without a special invite of sorts) was very encouraging and highly appreciated by the home boys. 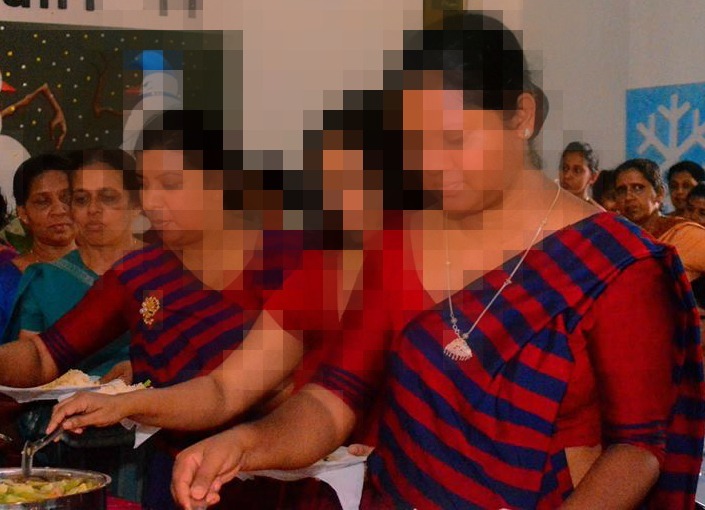 The administration of Kingswood was represented by the Deputy Principal Mr. Herath, though invitations were extended to other parties as well. From a Kingswood perspective, the team showed appreciable maturity and a ‘peaking’ of working together as a team for two years. This was their third triumph in three tournaments, and their second against Hillwood in two outings. Hillwood College, with years ahead of them, was probably the “fire-cracker” of the tournament, showing tremendous growth over the past year or so. The team is well balanced and shows much intent and promise for the year to come. Girls’ High School, too, fielded a tested formation, who have been debating together for the past two years or so; and their semi final loss came for no fault of theirs: clearly, they were trumped by the better team on the day, in a debate that could have gone either way. The best positive of the tournament, however, was the return of a very young St. Anthony’s team, whose debating has been a bit shaky over the past decade or so. This team showed much commitment and flair, and hinted at positives that await us in the next year or two, from the Katugastota school. The semi final berth they had at the tournament was yet SACK’s best performance at the de Lanerolle series. The Kingswood team: Bihan Viranga De Silva (Cpt), Gowthaman Nallaretnam, Abdul Azeez, Shakir Siddeek. The KM de Lanerolle Trophy and the Spencer Challenge Shield (Overall Winner): Kingswood College. The PH Nonis Memorial Trophy (Runner Up): Hillwood College. The Utting Memorial Trophy (Third Place): Girls’ High School. Best Speaker (VD Paulraj Memorial Prize): Bindya Bandare, Hillwood College. Best Fourth Speaker: Nushara Amarasekara, Girls’ High School. Best Speaker of the Old Boys vs Kingswood debate: Bihan Viranga De Silva, Kingswood. Indika Senaratne Selected for Central Stags. Former Kingswood batting all rounder Indika Senaratne has been called on to play for Central Stags in the New Zealand domestic T-20 championship. Indika, who was a dashing top order for Kingswood in the early 2000s (Senior Year being 2005/06), later went on to play for BRC and Ragama CC, prior to migration to New Zealand. Senaratne was one of the anchors of Kingswood’s top order throughout his playing years, and a reliable off break bowler. Indika was briefly in the news in 2009, when he smashed 281 in 129 balls for a domestic tournament (North Essex League) representing Mistly, which was an all time best in that championship. We wish Indika all the very best in the New Zealand top League and hope for a decent break into International Level Cricket at a suitable point. ගුරු සිත නොරිදවා, අකුරු නොවරදවා කියන වග නම්, පසුගිය අවුරුදු දෙකක් වැනි කාලසීමාවකදී ආරම්භ වී, ක්‍රමක්‍රමයෙන් ඔඩුදුවන තත්වයකට පත්වීගෙන යන, විද්‍යාලයේ විශේෂ අවස්ථාවන් සමහරකට විද්‍යාලයේ වර්ණ යෙදූ සාරි භාවිතය පිලිකුලක් පමණක් ඇති කරන බවයි. එය අල්පේච්ඡතාව අගයන, සරල බවට මුල් තැන දෙන, බරක් පතලක් ගැඹුරක් සහිතව හිතන කිංස්වුඩ් සම්ප්‍රදාය හා නොපෑහෙන බවයි. ශ්‍රීලංකාව සහභාගී වන ක්‍රිකට් තරගයක් නැරඹීමට යාමේදී ශ්‍රීලංකා “ෆෑන් ෂර්ට්” එකක් දවටගෙන යාම සාධාරණීකරනය කල හැකි වුවත්, කිංස්වුඩ් වර්ණ රාත්‍රිය‍‍ට හෝ ගුරු දිනය‍‍ට හෝ මෙවන් “ෆෑන් සාරි” පොරවන් එන කීපදෙනාගෙන් යම් කිසි හිස්බවක් හා නොමේරූ කමක් දිස් වන බව නොසතුටින් වුව සදහන් කල යුතුය. මෙම “මේනියාවට” ගොදුරු වූවන් සහ රුකුල් සපයන්නන් ඇත්තේ කීපදෙනෙක් බව පෙනෙන්නට ඇතත්, මේවන් ළදරු ක්‍රියාකාරකම් දලු ලා වැඩීම කිසිසේත් අනුමත නොකරමු. ගුරු මහත්ම මහත්මීන් නිරතුරුවම වඩා ඵලදායී ආකල්ප වර්ධනයෙහි නියුක්ත වීම ශිෂ්‍ය සුභසාධනයට බලපානවා පමණක් නොව, විද්‍යාලයේ අකාලික වටිනාකම් ආරක්ෂනයටද එයින් පිටුවහලක් ලැබෙනු ඇත. විද්‍යාලයේ වර්ණ සහිත සාරි දවටගෙන, “ෆෑන් ජර්සි” මානසිකත්වයෙන් ඔද්දල්ව රැන්ඩ්ල්ස් භූමිය නිවට බිමක් ව ජරාජීර්නව යාමට ඇති ඉඩකඩ සීමාකල යුතු බව කිංස්වුඩ් මැටර්ස්හි මතයයි. ගුවන් යානා සමාගමක “හොස්ටස්” රැකියාව කරන පිරිසක් සිහිගන්වමින් එකම ආකාරයට අපගේ සම්ප්‍රදාය හා ප්‍රෞඩත්වය විදහා පාන පාසල් වර්ණවලින් සැකසූ සාරි දවටගෙන කරන රංගනය ඛේදාන්ත ගණයේ නාට්‍යයක්ම පමණි. (මෙහිදී භාවිත කර ඇත්තේ ෆ්ලෑෂින් යූත් සංසදය විසින් ගන්නා ලද සේයාවකි. මෙය වාණිජ අරමුණකින් උපුටාගෙන නැත. එම සංසදයේ කතෘබව මෙයින් උච්ඡාරනය කර සිටිමු). Blaze Explains the Meaning of “Gentleman”. You know it has been customary to address students as “Gentlemen of Kingswood”; Not as ‘Boys” as “Kingswoodians” or even as “my dear young friends”, but as “Gentlemen of Kingswood”, with an emphasis on the “Gentlemen.” You may wonder why this custom was established. What you read below is the explanation of Mr. L.E. Blaze, Founder Principal and the initiator of the custom. The list of these things which a Gentleman cannot do might be indefinitely extended; but as a general rule it will be sufficient if we remember that we cannot do whatever is mean or unmanly, whatever he would be, or ought to be ashamed of, if it were found out. “No.” said Mr. Boulton “they have just lost one.” That is the Kingswood spirit even in defeat. When we say, as we do sometimes, “So and so is a gentleman,” what do we mean? That he is just, that he is kind, that he is courteous, that he is liberal in his gifts and in his outlook. A gentleman never boasts, never pushes himself forward, even when he has the right to do so. He is courteous, – not only to those in high places, but equally to those of humble station. He gives up his seat to a lady, or an old man, or one who is physically frail. And when there is a garden party, for example, he will find a seat for anybody who needs one. Is it not delightful to be known and being spoken of being a Gentleman? It is even more delightful to be a Gentleman, in our actions, in our speech, and in the thoughts of our mind. While you are here in school, in Kingswood, you have the opportunity of testing yourselves, of training yourselves. The word I leave with you is this: Be a Gentleman of Kingswood, loyal and manly Gentleman of Kingswood. අපි ඉවත් කල යුතු (දුර්)ගුණ / What We Ought to Discard. කිංස්වුඩ් වර්ණයන් උඩු වියනක් නොවිය යුතුය. ගුරු දිනයේ හෝ වෙන දිනයක හෝ ගුරු භක්තිය දක්වනු පිණිස අාච‍ාර්ය මණ්ඩලය විදුහලේ වර්ණිත මෙවන් බැනරයක් යටින් පෙලපාලි ගෙනයාම නෙ‍ාකල යුතුය. කිංස්වුඩ් වර්ණයන් චිරාත් කාලීනය. එය අපගේ හුදු වින්දනය පිණිස පවතින සංකලනයක් නොවේ. 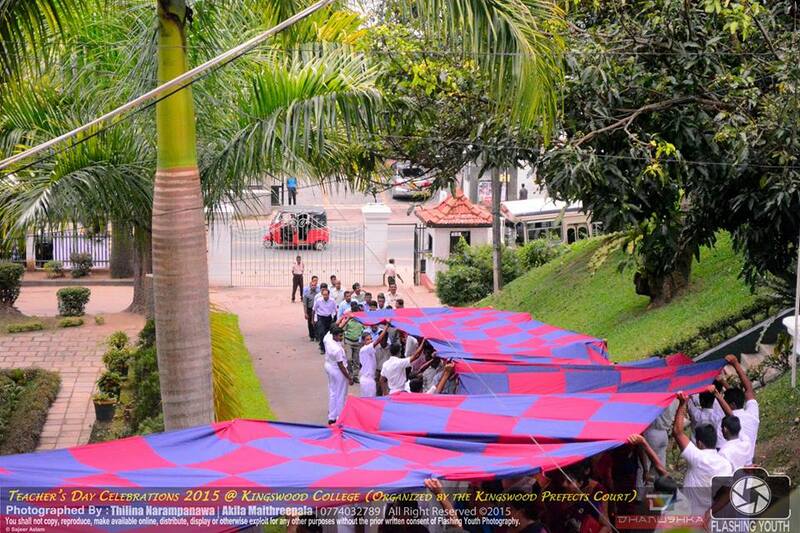 The Kingswood colours are not meant to be used as a banner for teachers, administrators — or whoever — to walk under. If this is the idea of making Teachers’ Day memorable, this should be thought of twice, because Kingswood and its representative colours are bigger than you and me. They are not toys to be played with. They are the colours we should respect and revere. මෙම ඡායාරූපය මෑතක දී කාලීන කරන ලද විදුහලේ ශිෂ්‍ය නායක නාමාවලියේ එකක් වන අතර කිංස්වුඩ් මැටර්ස් වෙත නිතරම කරුණු සපයන අපගේ ආදි ශිෂ්‍යයෙක් විසින් මෑතකදී ගත්තකි. මෙවන් නාමාවලියන් විදුහලේ ඉතිහාසය, අඛණ්ඩත්වය හා සම්ප්‍රදාය හා තදින්ම සම්බන්ධ බැවින් මෙම කාලීන කිරීමේ ප්‍රයත්නය ඉතා ඉහලින් අගය කරමු. මීට ප්‍රධානම හේතුව වන්නේ මෙවන් ලේඛන අඛණ්ඩව හා විධිමත්ව පවත්වාගෙන යාමේදී විදුහල තරමක් මැලි බවක් දක්වා තිබීමයි. ශිෂ්‍ය නායකයින්ගේ නාමාවලිය කාලීන කිරීමෙන් පමණක් නොනැවතී ඉතිරි ලේඛනයන්ද ක්‍රම ක්‍රමයෙන් විධිමත් කෙරෙනු ඇතැයි යන්න අපගේ බලාපොරොත්තුවයි. සාමාන්‍යයෙන් අප දකින්නේ ආදි ශිෂ්‍ය සංගමයේ සභාපති සහ ලේකම් යන තනතුරු අඩු වැඩි නැතිව නිරතුරුවම විධිමත් කෙරී ඇති තත්වයකි. නමුත් ක්‍රීඩා නායකයින්ගේ නම් ආදියට එම භාග්‍යය හිමි වී නැත. මීට හේතුව කිංස්වුඩ් විදුහලේ පේන්ට් අහේනියක් පැවතීම විය නොහැක. තම සංගම් තනතුරු තානාන්තර ගැන සදහන් කරන අතරම මතු පරපුරෙහි දැන ගැනීම පිණිස එයටත් වඩා ඉතිහාසගත වටිනාකමක් ඇතැයි තර්ක කල හැකි ක්‍රීඩා ආදිය සම්බන්ධ නාමලේඛන ද සකසුරුවම් කිරීම බලවත් තැන්වල සිටින ආදි ශිෂ්‍ය මහතුන්ට පහසුවෙන්ම කල හැක. 1. 1997 හා 1998 — මෙහි සදහන් රොෂාන් හා HL පෙරේරා එකම අයෙක් බව අපගේ මතයයි. මේ 1998 දී ප්‍රධා‍න ශිෂ්‍ය නායකයා වූ HRL පෙරේරා හෙවත් රොෂාන්පෙරේරා විය යුතුය. රොෂාන් කිංස්වුඩ් ක්‍රිකට් කණ්ඩායමේද ආරම්භක පිතිකරුවා විය. 2. 1997 — රොෂාන්පෙරේරා 1998 ප්‍රධා‍න ශිෂ්‍ය නායකයා නම් 1997 ප්‍රධා‍න ශිෂ්‍ය නායකයා කවුද? අපගේ මතකයට අනුව 1997 ප්‍රධා‍න ශිෂ්‍ය නායකයා බුද්ධික ඒකනායක යි. ඔහු ද මෑත කාලයේ විදුහලින් බිහිවූ කැපී පෙනෙන ක්‍රිකට් ක්‍රීඩකයෙකි. කණ්ඩායම් නායකයෙකි. 3. 1999 — මෙහි ප්‍රධා‍න ශිෂ්‍ය නායකයා ලෙස ජීවා ගල්ගමුව නම් කර ඇත. සත්‍ය තත්වය මධ්‍යස්තව සොයා බැලිය යුතු වේ. අප දන්නා තරමින් 1999ට ප්‍රධා‍න ශිෂ්‍ය නායකයෙක් සිටියේ නැත. එම වසරට අනුරූප ශිෂ්‍ය නායක මණ්ඩලයම යම් හේතුවක් නිසා ඉවත් කෙරුණු / වුණු අතර 1999 වසර පුරාවට ප්‍රධා‍න ශිෂ්‍ය නායක ධුරය “රොස්ටර්” ක්‍රමයට හුවමාරු වෙමින් පැවතියේ ඊ‍ට කනිෂ්ට කාන්ඩය අතරයි. අප කල විමසුමකදී 1999 කාන්ඩයේ සිටි (සහ ඉවත් කෙරුනු) ශිෂ්‍ය නායකයෙක් ද පැවසූයේ ඔහු දන්නා තරමින් 1999ට ප්‍රධා‍න ශිෂ්‍ය නායක ප්‍රදානයක් නොකෙරුනු බවයි. 4. 2003 — ප්‍රධා‍න ශිෂ්‍ය නායක මුලකුරු “WD” වියයුතු අතර එය “DK” නොවේ. මෙම ආභාසන් ඉවත් කර මෙම නාමලේඛන වඩා ක්‍රමානුකූලව සහ ඉතිහාසය හා ගැලපෙන අයුරින් සකස් වෙනු ඇතැයි බලාපොරොත්තු වෙමු. අප මෙහි ඉදිරිපත් කරන කරුණු ද 100% ක් නිදොස් දැයි අපටම සැකයක් පවතී. ඉතාම සාධාරණ මූලාශ්‍ර සොයා යෑම මහත්මා ලක්ෂණයකි.